The stand-out sensory experience from a recent week in Barcelona came courtesy of a nameless red vermut at a natural wine bar. It showed up in the customary regional fashion, with a citrus peel over a big ice cube, looking far more like sangria than fine wine. At €2.50, it was the least expensive item on the menu. And it outshined even the very pretty skin-contact Cava we drank afterwards for complexity, length, and sheer idiosyncrasy. Someone had taken the kitchen-sink approach to the botanicals, but to good effect: bitter citrus zest, sappy herbals, and warm woodsy notes wrapped themselves around a sensibly modest sweet core, and the finish hung on and kept evolving after the sweetness faded. Under different circumstances, it would have been a bit heavy-handed. In muggy Barcelona, with salty olives – and an after an intense week of academic conferencing during which I lost my voice more than once – it was an ideal combination of aperitif, conversation piece, and cough medicine. 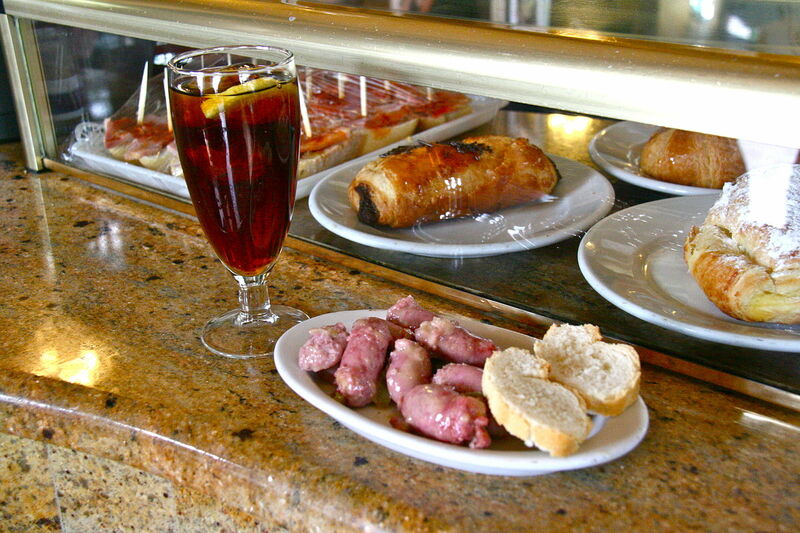 I’m not telling this story because I want to tell you about vermut, as Catalans call their traditional take on vermouth. Spain’s iconic day-time drink has garnered plenty of wine writer attention of the next-new-thing variety – though my local Barcelona friends claimed that it remains kind-of an old person’s drink, a little unfashionable unless you’re a hipster or a tourist (or both). I’m telling this story because it helps me tell another story, about how a group of scientists in a tiny town in Priorat are helping Spanish winemakers make their best wine. 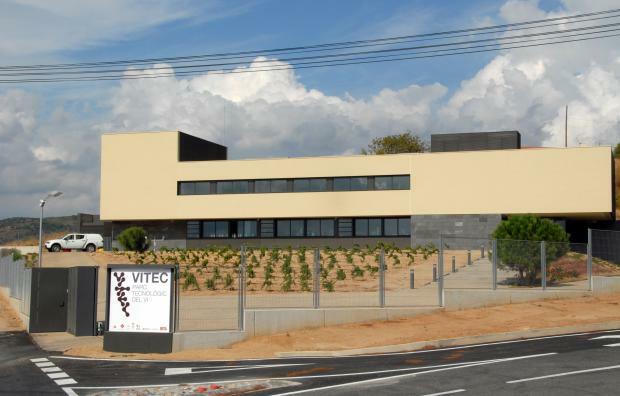 Vitec (caution: page in Spanish or Catalan) is the Spanish wine research center. It began as an empty shell of a building and two employees in 2006: the University of Tarragona created the building and the two positions, then ran out of funding and left them to figure out what to do with the place. 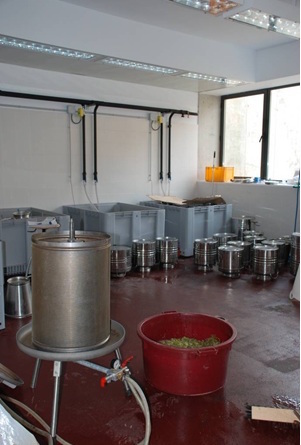 They began with a contract model, offering to solve problems for Spanish wineries for the cost of running the experiments, paying staff salaries, and buying equipment. A decade later, that model has been so successful that the once-empty building is now full to overflowing with 18 full-time staff and absolutely top-notch scientific equipment. They have to rearrange everything that isn’t bolted to the floor so often to make space for new incoming projects that the director of sensory analysis giving me the tour kept forgetting where they’d put everything. Vitec is unique for a few reasons. They are, for one, the only research center solely devoted to the wine industry in Spain, and yet they’re located in the tiny town of Falset, in Priorat, surrounded by scrubby fields and not much else. Their closest neighbor is the local high school, where all students are required to take a basic viticulture and enology class as part of the standard curriculum. Most vineyards in the area are family-owned, and the local solution to the universal problem of needing extra staff at harvest-time is ordering all of the daughters and sons and cousins home for a work party. A few years back, the right decision-making people realized that Priorat’s wine – and maybe family relations, too – might benefit from everyone growing up with at least the basics. But a big part of what makes Vitec special is that they focus entirely on individual clients. Most hubs of wine research publish fact sheets and hold workshops and the like to share best practices and encourage wine industry members in their region to trod along scientifically tried and true paths. Vitec doesn’t. You can’t go to their website to check up on how to prune your garnatxa negra vines, or what to do about powdery mildew in your cariñena, even if you read Catalan. Why not? Why take the seemingly inefficient route of repeating themselves over and over to everyone who comes through their door? Because they don’t repeat themselves. Even if questions are sometimes similar, their solutions are different. They find that their research teams arrive at as many “best” ways to solve a problem as they have clients, and more, because the best solution for a client in one year may be different than the best solution for that same client a year or two later. We’re wine lovers. We know this already. Fine wine – leaving aside the homogenized mega-winery products – is about place, about people, about individual differences, about hands-on craft resisting the too-often thoughtless and lonely mass-production of modern life. An individual approach to wine science seems natural. But science is, in contrast, not usually about individuality. Science is usually about general principles, about testing a hypothesis over and over and over again with the goal of building a theory that can go anywhere and apply to anything. Newton’s laws of physics are famous because they’re (almost; thanks, Einstein) always valid. Which begs the question: do universal laws of wine science exist? The answer depends on how you define your terms. No question about it: the same fundamental principles underpin grapegrowing and wine making everywhere. Yeast turns sugar into ethanol and carbon dioxide. Anthocyanin molecules make wine red. A body in motion remains in motion unless acted upon by an external force. How those principles function in any given situation, however, is always different inasmuch as every situation is different. Here’s the thing: we can decide how different to make them. Every vine needs sunlight, but the sun hits every vineyard slope at a different angle. The basic principles are the same, but we can choose to account for any number of contextual variables. Or not. A body in motion remains in motion unless acted upon by an external force, but precisely how far your golf ball will roll before stopping on the turf changes every time. So do universal laws of wine science exist? That depends: do you want them to? Vitec’s modus operandi is to emphasize the differences. Ignoring the economic rationale behind their approach would be unfair. 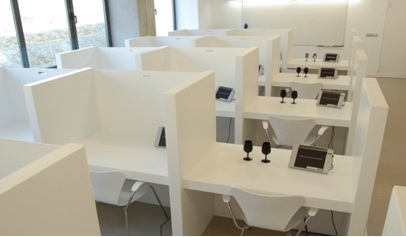 The center operates as an independent not-for-profit, loosely associated with the University of Tarragona but fully self-sufficient. Any money they make beyond staff salaries goes back into improving the research facility, but clients pay for services and vying for enough of them is what keeps the place running. Of course they’re serving individual clients. Contrast that with the typical model in the United States where extension scientists employed by a public university are expected to provide free services to their state industry from a limited budget of mostly-public funds. Under those circumstances, trying to reach everyone with a portfolio of one-size-fits-most solutions (and then also answering specific questions on a case-by-case basis) is practically a given. All of that said, I think the Spanish scientists are on to something. That dusky red vermut I enjoyed in Barcelona was incredible because it was so well-suited to its time and place and purpose; heck, its color even played well with the décor of the wine bar. The “best wine” doesn’t exist. There are as many “best wines” as occasions to drink them. As wine lovers we should be looking not for some scientifically determined ideal of perfection, but for the beauty of an experience that is inevitably, delightfully, irreplacably located in a unique time and place. Maybe making fine wine science more like we make fine wine makes sense. Sounds like a fascinating place Erika. But I’m afraid two parts of your opening salvo distracted me to the point that I could hardly read the rest of the article. 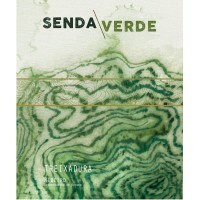 First – skin contact cava? Name names please! This is a style I haven’t ever come across, but it sounds fascinating. Second – “outshone”, surely? And I really must apologise for either being a pedant, or worse, perhaps not understanding different use of grammar in US English? I was thinking about this comment the other day while I shone my shoes. Ha. Touché! No-one said english was a regular language did they? Are you seriously saying Americans say “outshined” in this usage? (It is wrong as far as I’m concerned). Fascinating. I am so glad you shone a light on this one for me. I genuinely had no idea.